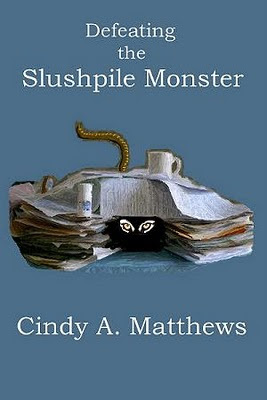 Cindy A. Matthews: Confessions of a Blonde Writer: Defeating the Slushpile Monster - Now in print! Defeating the Slushpile Monster - Now in print! According to a recent National Education Association's Reading at Risk study, 15 million Americans have attempted some kind of "creative writing". Very few of these writers have had their work successfully published. Want to know how you can improve your chances? You can find the answers in my funny guide for serious writers. Laugh while you learn how you can improve your manuscript's chances of surviving the arduous submission process. Find out how "Only You Can Prevent Formatting Follies" and how to avoid those "Prose Pile-Ups on Publication Road". Editors are busy people. Sometimes they are not in a very good frame of mind by the time they’ve read their way down a stack of submissions to reach yours. In order to improve your chances, you’ve got to make the editor want to read your manuscript, even if the office is dark and spooky and she’s sitting all alone in her cubicle. The answer is so simple you’ll probably slap your forehead in disgust for not thinking of it first: Never submit a first draft. The purple-crayon manuscript was a first draft manuscript. It doesn’t matter if the author claims to have re-written her story two-hundred times before she sent it in for consideration, the end result is the same. The purple-crayon manuscript suffers from a terminal case of first-draftitis. Remember, an editor is a busy person. (Feel free to substitute the word “agent” for editor throughout this text if it applies to your situation.) An editor has neither the time nor inclination to help you shape up your story. Your novel needs to be complete, and it needs to be publishable with only minor fixes. To submit anything else to an editor is to waste his or her valuable time. This point cannot be emphasized enough and is perhaps more true today than ever before. Only best-selling authors like Stephen King, Nora Roberts or J.K. Rowling can sell a first draft for seven figures or more. But, then again, these big-names probably could sell their hand-scribbled grocery lists for at least half that much. We no-name writers should be so lucky! I know it’s a hard pill to swallow, but I’d rather you hear the following from me rather than from someone with less tact. So get the moony-eyed notion out of your head right now as I deliver the bad news: Editors have better things to do with their time than work with you to improve your book until it meets their standards for publication. I know it hurts to think you and your book aren’t special, but there you go. If you make the mistake of writing a letter to an editor asking her to make an exception just for you, she’ll promptly tell you that sort of thing isn’t in her job description and reject your work without even reading a page. What are some of the symptoms of first draftitis? Can this dreaded manuscript disease be avoided? Read on. You’ll see that most cases are far from deadly and that the patient can be resuscitated easily and live to become published another day. Have you ever been on a job interview? Have you ever attended a business convention? Have you ever owned and run your own business? If you’ve done any of these things, then you probably have encountered business cards. So, what is a writers business card? Why, his or her manuscript, of course. Remember, the editor is a busy person. She wants to read your manuscript and quickly make up her mind if her publishing firm can use your services. She needs to be convinced from the very first line, the very first paragraph, the very first page that you are who you claim to be—a capable writer—and that you can deliver the goods—a complete, publishable manuscript. Your job is to make your business card as professional as possible. No sprinkled lavender cologne, no fancy fonts, print faces or paper colors. This is a professional presentation—not your teenager’s diary. Act like a professional and you will be treated as such.